A gene is a section of DNA that is transcribed into RNA which in turn encodes a protein (although a small number of unusual genes are not translated and indeed cannot be translated into protein). For reasons that are still unclear, large portions of transcribed RNA are excised (by RNA splicing enzymes) and additional modifications are made to the ends of the RNA molecule (capping of one end and polyadenylation of the other). The final product, messenger RNA ( mRNA), contains a central section, translated into protein, and flanking non-coding regions. The consequence of these manipulations is that DNA and mRNA are not coterminous; sections of DNA that encode mRNA (termed exons) are interrupted by often very large stretches of DNA that are not translated (termed introns) ( Fig 1). Fig. 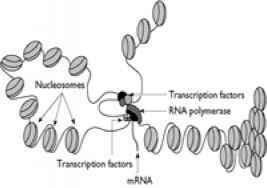 1 The figure shows the process of transcription by which mRNA is produced from DNA. At the top of the figure the organization of a gene in genomic DNA is shown. Unshaded boxes correspond to coding regions (exons) and the two shaded boxes correspond to control regions. The control region immediately 5' of the first exon, where transcription is initiated, is known as the promoter and often has a characteristic sequence composition. In almost all ubiquitously expressed genes (and in many tissue-specific genes) it is unmethylated, GC rich, and has a relative excess of the dinucleotide CpG. The region, which typically contains the first exon as well as the promoter, is called a CpG island. The boundaries between exons and introns are called splice sites and are conserved; introns virtually always start with the sequence GT and end with the sequence AG. The entire genomic region is transcribed into a primary transcript (bold arrow) which is then processed to excise the introns. Many human genes undergo alternative splicing to yield a number of different mRNA products. Mature mRNA is then translated into a protein product. 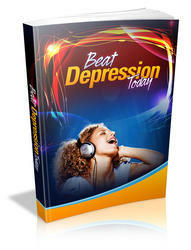 We know of a number of ways in which gene expression is controlled. Predominantly it occurs at the level of transcription (but post-transcriptional processing and translational control are important for some genes). 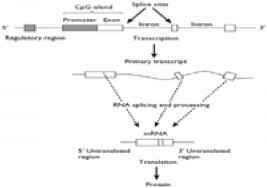 Transcriptional control involves at least three mechanisms, which are illustrated in Fig;..,.?. Fig. 2 Factors involved in regulating the transcription of DNA. Gene expression requires an RNA polymerase which initially binds to the 5' end of the gene at the promoter. The figure shows polymerization occurring once transcription factors have bound to DNA and to the polymerase. Note that the transcription factors are binding not only close to the gene, but also at a distance. Transcription occurs in the centre of the figure, in a region of DNA devoid of chromatin. Shaded ovals indicate nucleosomes, one level at which chromatin packages DNA. The higher-order structure of chromatin is unknown, but is indicated on the right of the figure by tightly packed nucleosomes. First, transcription factors exercise control over gene expression. Transcription occurs when RNA polymerases manufacture RNA from the template DNA, a process that requires the help of transcription factors, proteins that recognize and bind to specific DNA sequences (note that transcription factors can also repress transcription). Although transcription factor binding sites are found close to a gene, at a 5' region known as the promoter (see Fig 1), they may also be situated far away, sometimes within other genes. Transcription factors are themselves the products of genes, so that they may control their own expression or be part of more complex sets of interacting regulatory pathways. Gene expression can also be altered by the addition of methyl groups to cytosine bases. Methylation of DNA does not change the DNA sequence but, when it affects control regions, is associated with gene inactivation. It is not clear whether methylation is an independent mechanism for regulating gene expression, since methylation directs chromatin into an inactive conformation, mediated by methylated DNA binding proteins. 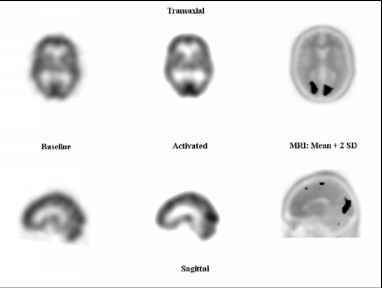 Changes in methylation are involved in at least two mental retardation syndromes (the Prader-Willi and Angelman syndromes, discussed below).